OK, I think it' high time I let you know something we've been hiding for quite awhile... Actually, if you happen to live near me, it's not something that is really easy to hide! My real excuse for being such a horribly pathetic blogger this spring and summer is that we are expecting a baby this fall! We had started to fill out adoption paperwork this winter and then God put a hold on that plan when we found out about this surprise in late February! This is me at 20 weeks... Tomorrow I will be 26 weeks, wow! Time is really flying now, but it did not fly in March, April and May when I laid on the couch most of the time. Emelia was a great helper to me and she got lots of Mommy training for when she has a home of her own someday:) She is also the photographer of these pics... I wonder where she gets such talent? So far the pregnancy has gone well with nothing major to complain about. I have noticed some differences, being just a FEW years older this time! Honestly I cannot complain because I feel just so honored that God would choose to allow me one more time to carry life inside of me. I know some of you know that ache of not being able to ever carry a child or know the pain of never carrying to full term. We ourselves have had a few babies that never made it full term and I think it just makes me more thankful for what we have and this blessing of another baby. It has been a little confusing at the same time, saying, God I thought you wanted us to adopt a child... But we know He is in control and He is the life giver. In any event I am trying to cherish each day with my girls, knowing that in a few short weeks life as we know it will change again. And feeling those sweet kicks is one of my greatest treasures that I will never tire of. Oh, so you want to know what kind of baby? Yes, we did find out this time. But you'll have to stay tuned, otherwise how will I keep you coming back for more? Did you know that this child asked for the book Pinkalicious for her birthday? Yep, begged for it! I have been doing a bit of sewing... not as much as I'd like to, but I have managed to complete a few baby blankets for friends and family who have all been so blessed with new babies of late! This first one was for a friend from Iowa who had a baby boy at the end of January. She likes blues and browns. (So do I!) And this one was for my new niece Miss Lola! She was born at the beginning of March and is a sweet honey buns for sure! I'm actually super happy that I had lots of left over squares from this project and look forward to making something with them! 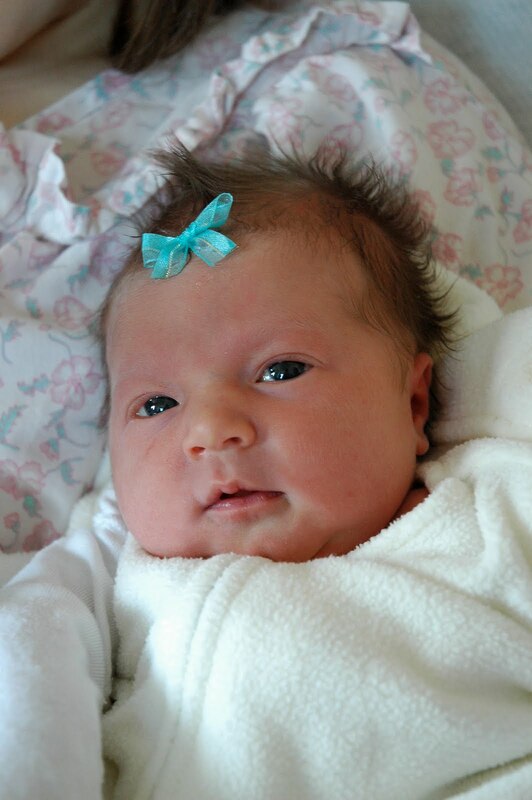 And if one sweet niece was not enough, Miss Celine joined the clan at the end of March! Miss Celine is a tiny itty bitty super yummy peach, especially next to her big brother Z! Ohh, so lucky to have all this sweetness in one family:) I also made a matching bumper pad and skirt to go with this quilt, but forgot to take a picture! The prints have kind-of a 70's feel to them. Very fun and I've got scraps left over from this project too. Yeah, so the problem is that I have been accumulating some new fabrics... not exactly sticking to my new years goals... I guess it's no time like the present to remind myself of my goals. Next week Ted and I are getting away to northern MN and I plan to take my machine along. Maybe I can get back to some of those nice half done projects just waiting for me to finish them. I wonder if I still have any followers? I won't blame you if you have given up all hope of me ever blogging again. I have a really good explanation. Really. GOOD! But first you have to play a game with me. Can you guess what the photo is of that I have just below? If you are in the "in crowd" you can't play this game... You know who you are... Ohh, Me, Me, I know, I know!